Nikon has just announced the first full frame camera optimized for astronomical photography: the Nikon D810A ('A' for astronomy). Like Canon's such models, the legendary EOS20Da current 60Da, the D810A is a largely standard D810 except for its enhanced sensitivity to the hydrogen alpha wavelengths, which make it, hands-down, better (Nikon claims 4 times better) than any standard dSLR for capturing the brilliant reds common to deep sky objects. In addition to increased sensitivity to reds, Nikon has added a few other features onto the D810A to make it more astro-friendly. First up: a new long exposure mode, wherein users can select shutter speeds ranging from 4 seconds to 15 minutes before having to result to bulb mode. Another big addition not seen on the D810: image preview in long exposure and bulb mode, which allows the camera to collect photons so that an image can be previewed before it is actually taken, much the same way Olympus uses such a feature so that users can preview their images with various special effect filters. Two more, smaller benefits include a red virtual horizon and the ability to dim the OLED display in the viewfinder, both of which are night vision-friendly touches. 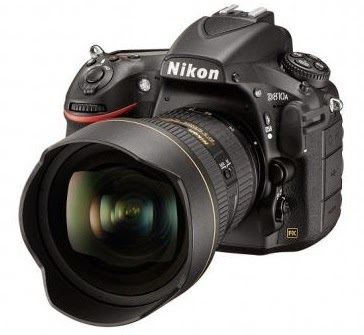 Lastly, Nikon claims to have tweaked the sensor for even better low-noise performance than on the standard D810. Well, there's good and bad news. The good: the D810A will start shipping in late May. The bad: price is TBA (persona;lly, I expect a 10-20% premium over the standard D810). More bad: a lot of astrophotographers are drooling over this as you read right this very second, which means that you should preorder yours ASAP and worry about the price later before the line gets too long!